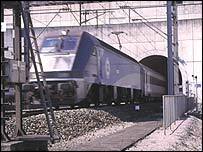 Four illegal immigrants attempted to enter Britain by walking through the Channel Tunnel. The men, thought to be in their 20s and from Afghanistan, had managed to evade security in France to enter the tunnel. But they were spotted by a train driver and by cameras as they walked along the 32-mile tunnel on Wednesday morning. The men were stopped after a few miles and were handed over to French Police and later charged. Eurotunnel said traffic was stopped for three hours. But the company said the incident only had an impact on one tunnel and the overall running of the system was not affected. Spokesman John Keefe said: "The men were charged with a variety of offences including breaking into the secure zone. "The incident did not stop the running of the tunnel and this is an extremely rare occurrence. "It used to happen at the height of the illegal immigration crisis in and around 2000 but since the closure of Sangatte these types of instances occur very rarely. "Inevitably when they do happen, we take every action to recover those trying to make an illegal entry and do ensure services are unaffected."